Combining in-situ data from single-point time series with remotely sensed spatial data allowed a greater elucidation of changes in chlorophyll-a concentrations through wet season conditions in the Great Barrier Reef coastal waters. Single-point time-series data were collected from 2006 to 2012 during high river flow conditions to assess changes in phytoplankton biomass (measured as chlorophyll-a). Additionally, three flood plume water types, derived from classified true-colour Aqua moderate resolution imaging spectroradiometer (MODIS) images, were used to group single-point time-series data for the phytoplankton biomass assessment. Survey data illustrate the heterogeneity of chlorophyll-a distribution over seasonal and inter-annual cycles and the difficulty in describing community responses through the wet season. The spatial data demonstrate distinct regional differences throughout the Great Barrier Reef. The high chlorophyll-a concentrations measured in flood plume waters immediately adjacent to the inshore, highly turbid 'inner’ flood plume are a product of sufficient light, given most of the suspended solids have settled from the plume, and the availability of sufficient nutrients, which drive higher phytoplankton production and characterise the formation of secondary stage flood plumes. The formation and extent of these secondary flood plumes were mapped using MODIS true-colour satellite imagery. The distance and the location of the secondary plume water are reliant on flow, coastal hydrodynamics, and biological activity. The combination of in-situ data and remotely sensed data provides information on the complexity of these coastal processes during the wet season and offers managers a more comprehensive understanding of the extent of nutrient enrichment in the Great Barrier Reef coastal area and the potential influence of flood plumes on coastal marine ecosystems. The primary biological response to nutrient enrichment in aquatic environments, given suitable conditions such as light availability and water temperatures, is the growth of phytoplankton and higher plants. Known consequences of nutrient enrichment on the phytoplankton community can be measured by elevated phytoplankton biomass (Boynton et al. 1996;Bricker et al. 2003;Brodie et al. 2007) and alterations of the natural phytoplankton community composition, which may in turn change ecosystem food web and nutrient cycling dynamics (Cloern 2001;Brodie et al. 2005;Devlin et al. 2009). The understanding of nutrient enrichment and potential eutrophication in the Great Barrier Reef (GBR) has progressed in recent years with key publications identifying responses to nutrient loading for corals (Fabricius 20052011;Brodie et al. 20112012) and seagrasses (Schaffelke et al. 2005;Collier et al. 2012;McKenzie et al. 2010), as well as phytoplankton communities (Furnas et al. 2005;Sorokin and Sorokin 2010;see references in Devlin et al. 2013). The nutrients introduced or released during high flow river discharge into the GBR are rapidly taken up by pelagic and benthic algae, and microbial communities (Alongi and McKinnon 2005), sometimes nourishing short-lived phytoplankton blooms and high levels of organic production (Furnas 1989;Furnas et al. 20052011). This organic matter is cycled through the marine food web and transformed, for example, into marine snow particles that may be deposited onto benthic communities, such as coral reefs, thus influencing their structure, productivity, and health (Anthony and Fabricius 2000;Fabricius and Wolanski 2000). Further, Brodie et al. (2005) and Fabricius et al. (2010) identify enhanced nutrient supply in river runoff as a critical requirement for enhanced Acanthaster planci (commonly known as the crown-of-thorns starfish or COTS) larval survival in the GBR, a finding that supports Lucas’ (1982) hypothesis that COTS suffer high levels of larval starvation in the absence of phytoplankton blooms. COTS are of great importance in the GBR as a predator on coral and are recognised as one of the leading causes of mid-shelf coral mortality in the GBR (De’ath et al. 2012). Measurement of chlorophyll-a (hereafter chl-a) concentrations derived from phytoplankton biomass can be indicative of enhanced nutrient inputs (Spencer 1985;Furnas et al. 2005;Brodie et al. 2007) and thus provides a simple, reliable indicator of water column nutrient status in the absence of high frequency water column nutrient concentration measurements (Harding and Perry 1997;Yunev et al. 2002). Chl-a concentrations in the GBR waters have been successfully utilised as a proxy measurement of phytoplankton biomass and nutrient concentrations for a number of monitoring programs in the past (Brodie and Furnas 1994;Brodie et al. 19972007;Furnas and Brodie 1996;Steven et al. 1998). The frequency of in-situ sampling methods is associated with cost, time, weather, and logistic constraints and only a limited number of sampling points can be monitored during any one flood event. This restriction might limit the assessment of the range and variability of coastal processes and water constituents (Novoa et al. 2012). Conversely, satellite sensors provide an effective means for frequent and synoptic water quality observations over large areas. Remotely sensed data (e.g., derived ocean colour products) have increasingly become a tool by which scientists and managers can supplement long-term monitoring datasets of in-situ water quality measurements (Brando et al. 2010;Kennedy et al. 2012;Schroeder et al. 2012;Devlin et al. 2012b). Remotely sensed data have thus provided an essential source of information related to the movement and composition of flood plumes in GBR waters, extending the utility of the in-situ sampled data at both regional and temporal scales. Assessing chl-a concentrations with remotely sensed data in optically complex coastal waters, such as the GBR coastal waters, where suspended sediment and coloured dissolved organic matter (hereafter CDOM) co-occur with phytoplankton, is notoriously difficult (e.g., Gitelson et al. 2009;Odermatt et al. 2012). The standard and global bio-optical algorithms used in oceanic waters (Case 1 waters; Morel and Prieur 1977;Gordon and Morel 1983;Morel 1988) are inaccurate when applied to optically complex coastal waters (Case 2 waters; Morel and Prieur 1977;Gordon and Morel 1983;Morel 1988), although regional parameterisation of these algorithms can help increase their accuracies (Naik et al. 2013;Brando et al. 2012). Some recent studies have investigated the use of remote-sensing products in the mapping of water quality parameters, particularly the use of chlorophyll and CDOM products, both for global and regional assessments (Devlin et al. 2012b;Brando et al. 20102012;Schroeder et al. 2012). However, the retrieval of chlorophyll data based on the application of bio-optical algorithms (e.g., Level 2, chl-a product) is still problematic in Case 2, turbid nearshore waters (Wang and Shi 2007;Gitelson et al. 2009;Odermatt et al. 2012). Our study utilises the variation in ocean colour to map the gradient in water quality concentrations across flood plumes to avoid these inherent problems of retrieving chl-a measurements in Case 2 waters. 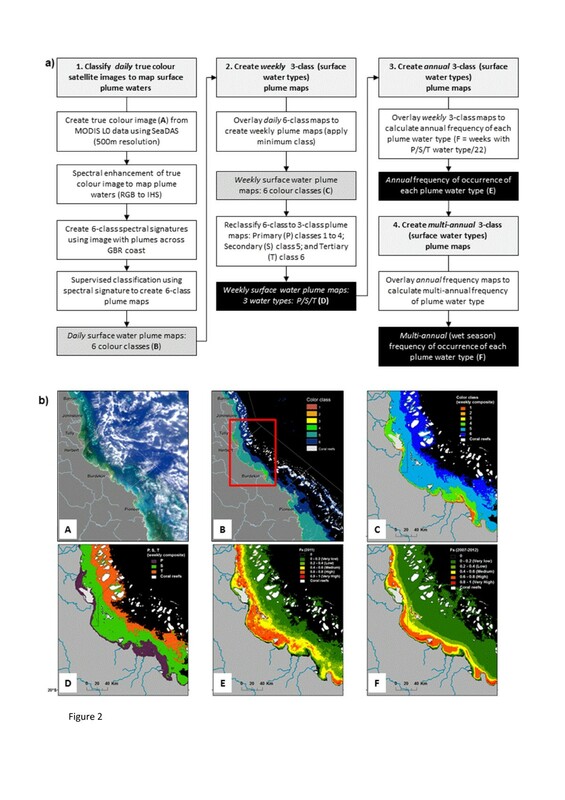 The same approach has been applied to map flood plumes using moderate resolution imaging spectroradiometer (MODIS) imagery, allowing assessment of their extent and influence on GBR ecosystems (Bainbridge et al. 2012;Brodie et al. 2010;Devlin et al. 2012a, b;Schroeder et al. 2012;Álvarez-Romero et al. 2013). Our study extends earlier work on spatial and temporal patterns of chl-a distribution in the GRB (Steven et al. 1998;Brodie et al. 2007) with an analysis of a long-term dataset of chl-a concentrations collected in high flow conditions between December to April (wet season) from 2006 to 2013. This paper presents in-situ chl-a measurements sampled over variable conditions associated with the North Queensland wet season, coupled with spatial mapping outputs derived from MODIS true-colour images. The method applied in this work allowed us to assess the extent and characteristics of the dominant water of the flood plumes, without depending on the retrieval of Level 2 MODIS data in Case 2 waters. The information on the spatial extent of different flood plume water types, integrated with high frequency wet season sampling, provides a valuable tool from the environmental management perspective to assess the extent of the spatial and temporal distribution of chl-a concentrations and, hence, phytoplankton biomass in the Great Barrier Reef. The Great Barrier Reef extends approximately 2,000 km parallel to the Queensland east coast between 9˚S and 24˚S and covers approximately 350,000 km2. An inner shelf area with water depths of up to 20 m is immediately adjacent to the coast. This area contains coastal and island fringing reefs and intertidal and shallow water seagrass beds. The inshore area is significantly affected by adjacent coastal influences, and its sediments are composed of predominantly terrestrial-sourced material (Brodie et al. 2012). Data have been collected as part of the water quality program under the Reef Rescue Marine Monitoring Program (hereafter RRMMP), which aims to investigate the influence of terrestrial runoff on inshore GBR water quality (Johnson et al. 2011;Devlin et al. 2011). Water samples for this work were collected along four regions of the northeastern Australian coast within the Great Barrier Reef: the Tully (18˚S) and Herbert (18.5˚S) regions, within the wet tropics area and the Burdekin (19.5˚S) and Fitzroy (23.5˚S) regions, within the dry tropics (Figure 1). Discrete regional cross-shelf transects were monitored within each region during the wet season (ca. December to April) from 2006 to 2013. Sampling was initiated at the onset of the wet season, targeting the period after first flush, the rise, peak and flux of high river flow conditions. In addition, sampling continued through the wet season through variable flow conditions and water characteristics. The sampling dates were determined by logistics such as prevailing weather conditions and the location of the flooding rivers. The intensity of sampling varied between regions in relation to the logistics of sampling and the frequency of high flow periods. The design of the flood monitoring program under the current Marine Monitoring Program is detailed in Devlin et al. (2011). Location of sampling data for the period 2006–2013 for all regions. (a) The Tully (18˚S) and Herbert (18.5˚S) regions, within the wet tropics area, and (b) the Burdekin (19.5˚S) and Fitzroy (23.5˚S) regions within the dry tropics for the Tully marine area. For management purposes the catchment of the GBR was subdivided into five natural resource management (NRM) regions (black lines). These NRM regions extend seaward and are limited by the GBR Marine Park boundary. Water sampling focused on the top surface layer of the flood plumes. Sampling within flood plumes included the collection of water samples for the analysis of total suspended sediment (TSS), chl-a, salinity, and the diffuse attenuation coefficient of photosynthetically active radiation (KdPAR). Surface water for chl-a and TSS was collected using a clean polyethyelene bucket, with 1 L collected for TSS and 1 L collected in a dark bottle for chl-a. Both bottles were stored in cold and dark conditions for posterior filtration. Within 12 h of sampling, water for chl-a determination was filtered through a 47 mm Whatman GF/F glass-fibre filter (0.7-μm nominal pore size) with the addition of approximately 0.2 ml of magnesium carbonate. Filters were wrapped in aluminium foil and frozen. Pigment determinations from acetone extracts of filters were done using the spectrophotometry method described in 'Standard Methods for the Examination of Water and Wastewater, 10200 H. Chlorophyll’. Within 24 h, water for TSS analysis was passed through a pre-weighed 0.45-μm Millipore filter. After collection of suspended material, filters were rinsed with MilliQ water to remove salt. Filters were dried to a constant weight, and the concentration of suspended sediment was determined by gravimetric method as presented in 'Standard Methods for the Examination of Water and Wastewater, 2540 D. Total Suspended Solids Dried at 103–105°C’. In addition to the water samples, depth profiles using a conductivity-temperature-depth (CTD) probe from Sea-Bird Electronics (SBE-19Plus) equipped with sensors for temperature, salinity, depth, and light were also carried out. The CTD probe was kept for 3 min at the water surface for sensor stabilisation before starting the downcast. Salinity and temperature reported for the first 0.5 m of depth were calculated as the average of readings between 0.3 and 0.7 m below the water surface; outliers were identified, prior to the timing of the stabilisation period, through sharp changes in salinity that occurred if the probe accidently touched to the sea floor. KdPAR readings were calculated using the Lambert-Beer Equation (Dennison et al. 1993). Further details on QC/QA procedures for all laboratory analyses are documented in GBRMPA (2012). Daily flow records from 35 stations distributed throughout the GBR were obtained from the Department of Environment and Resource Management (Queensland, http://watermonitoring.derm.qld.gov.au/host.htm). For a hydrologic characterisation of the sampling period, the total annual flow was compared against the long-term annual median flow calculated for the period 1970–2001. Annual flow volume was calculated considering a hydrological year from 1 October to 30 September. The influences of flow and salinity were investigated as correlative factors driving chl-a concentration. On a regional scale, the in-situ chl-a data were compared among the four regions studied (i.e., Tully, Hebert, Burdekin, and Fitzroy regions) by grouping the data in terms of salinity classes and runoff regimes. To do that, the discharges on the sampling dates from the closest river to the sampling site were grouped in terms of runoff percentile. Percentiles of 5, 25, 50, 75, and 95% were calculated from the long-term data record (i.e., January 1997 to April 2013) taking into account 5-day average runoff from the sample date of the river system visited (i.e., the Tully, Hebert, Burdekin, or Fitzroy rivers). The 5-day average was arbitrarily selected as a way to represent a potential delay between the river gauge measurements (average distance ~60 km from the river mouth) and the time it would take water to reach the closest sampling site (within 5–10 km from river mouth). In-situ salinity data were grouped within intervals of 10 (i.e., < 10, 10–20, 20–30, and > 30). In-situ chl-a data for each region were then characterised by runoff and salinity groups using box plots. In addition, chl-a data were plotted against guidelines for testing the reliability of chl-a measurements under the wet season conditions. Flood plumes were mapped in this work using the method presented in Álvarez-Romero et al. (2013). In this method, daily MODIS Level-0 data acquired from the NASA Ocean Colour website (http://oceancolour.gsfc.nasa.gov) are converted into quasi-true-colour images with a spatial resolution of 500 × 500 m using the SeaWiFS Data Analysis System (SeaDAS; Baith et al. 2001). The true-colour image is then spectrally enhanced (from red-green-blue to hue-saturation-intensity colour system) and classified to six colour categories through a supervised classification using spectral signatures from plume water in the GBR. The six colour classes are further reclassified into three flood plume water types (primary, secondary, tertiary) corresponding to the three water types defined by Devlin and Schaffelke (2009) and Devlin et al. (2012a). Figure 2 presents a diagram of the method described within Álvarez-Romero et al. (2013) with some intermediary-step images, and Table 1 presents a description of these plume water types and how they relate to the six colour classes derived from the Álvarez-Romero et al. (2013) method. The sediment-dominated waters or primary water type were defined as corresponding to colour classes 1 to 4 of Álvarez-Romero et al. (2013). The chl-a-dominated waters or secondary water type were defined as corresponding to the bluish-green waters (i.e., colour class 5 from Álvarez-Romero et al. 2013) and the tertiary water type was defined as corresponding to the colour class 6 of Álvarez-Romero et al. (2013) (see Table 1 and Figure 2). This supervised classification was used to classify 5 years of daily MODIS images [from December 2007 to April 2012, focused on the summer wet season (i.e., December to April inclusive]. Summary of the process followed to build plume water maps with examples of inputs and outputs. (a) Plume mapping process: different shadings represent steps (light gray), analyses within steps (white), intermediate outputs (dark gray), and final outputs (black) (modified from Álvarez-Romero et al. 2013). (b) A: Aqua MODIS true-colour image used to create the spectral signatures defining six colour classes for GBR plumes (25/01/2011) and B: weekly composite (19 to 25/01/2011) of six-class map (modified from Álvarez-Romero et al. 2013); C: weekly surface water plume map; D: reclassified map into weekly primary (P), secondary (S), and tertiary (T) composite (19 to 25/01/2011); E: frequency of occurrence of the secondary water type in 2011; F: multi-annual (2007–2012) frequency of occurrence of the secondary water type. Panels C–F are zoomed into the Tully-Burdekin area (see red box on panel B). Sediment-dominated waters: characterised by high values of coloured dissolved organic matters (CDOM) and total suspended sediment (TSS), with TSS concentrations dropping out rapidly as the heavier particulate material flocculates and settles to the sea floor (Devlin and Brodie 2005;Brodie and Waterhouse 2009). Turbidity levels limit the light (KdPAR) in these lower salinity waters, inhibiting production by primary producers and limiting chl-a concentrations. Greenish-brown to beige waters: Sediment particles are highly reflective in the red to infra-red wavelengths of the light spectrum. Sediment-dominated waters have a distinctive brown/beige colour, depending upon the concentration and mineral composition of the sediments. Chlorophyll-a-dominated waters: characterised by a region where CDOM is elevated with reduced TSS concentrations due to sedimentation. In this region, the increased light in comparison to primary water type condition (but still under marine ambient conditions) and nutrient availability prompt phytoplankton growth measured by elevated chl-a concentrations. Bluish-green waters: Due to this green pigment, chlorophyll/phytoplankton preferentially absorb the red and blue portions of the light spectrum (for photosynthesis) and reflect green light. Chl-a-dominated waters will appear as certain shades, from blue-green to green, depending upon the type and density of the phytoplankton population. CDOM-dominated waters: Offshore region of the plume that exhibits no or low TSS that has originated from the flood plume and above ambient concentrations of chl-a and CDOM. This region can be described as being the transition between secondary water type and marine ambient conditions. Dark yellow waters: CDOM are highly absorbing in the blue spectral domain. CDOM-dominated waters have a distinctive dark yellow colour. Weekly composite images were created to minimise the image area contaminated by dense cloud cover and intense sun glint (Álvarez-Romero et al. 2013). Weekly composites were assigned values of presence/absence of primary, secondary, or tertiary water type, and overlaid to generate an annual frequency map. The annual frequency of occurrence for each water type was calculated as the number of weeks that a pixel value was retrieved as primary, secondary or tertiary water type, divided by the maximum number of weeks in a wet season (i.e., 22 weeks taken from 1 December to 30 April). This overlay of water type imagery created annual (wet season) frequency maps of occurrence to primary (fp), secondary (fs), and tertiary (ft) water types for the whole GBR. Data in the annual maps were summed to calculate multi-annual (2007–2012) frequency of occurrence for each of the three plume water types. Annual frequency values depicting the extent of the secondary waters (fs) for each year from 2007 to 2012 were mapped for the areas between Cape York and the Fitzroy River. Mean annual (ca. from December to April) in-situ values of chl-a, TSS, and KdPAR were mapped against annual frequency maps of primary, secondary, and tertiary water types for each of the 6 years (2007–2012). The water quality data (chl-a, TSS, KdPAR) was assigned to primary, secondary, or tertiary water type where that frequency of the water type was greater than 0.5, signifying the pixel was identified as a primary, secondary, or tertiary water type for at least 50% of the wet season. The mean value (x ± standard error) of chl-a, KdPAR, and TSS was then calculated for each water type over the sampling period (Figure 3, step i). Summary of the process followed to compare and validate in-situ water quality concentrations with the information derived from annual and multi-annual frequency maps. Over the whole GBR, TSS, chl-a, and KdPAR data were aggregated into 20 equidistant frequency classes representing the range of normalised frequency values (0–1) for each wet season for the primary, secondary, and tertiary maps. The mean values for TSS, chl-a, and KdPAR were calculated against each of these frequency classes for primary (fp), secondary (fs), and tertiary (ft) water type (see Figure 3, step ii). In the last 5 years from 2007 to 2013, the total annual discharge for 35 rivers distributed throughout the GBR has exceeded the total annual long-term median calculated for the hydrological year (i.e., 1 October to 30 September) covering the period 1970–2000, with exceedances ranging from 66 to 620% higher than the long-term median flow (Figure 4). Record flow conditions were measured for 2010–2011, where a combination of three cyclones produced record flows in nearly all GBR rivers, particularly in the southern half of the GBR. Flows in the latter 3 years have been dominated by large floods out of the southern rivers, particularly the large dry tropic rivers, Burdekin and Fitzroy, and by the southern influence of flow from the Burnett-Mary (Devlin et al. 2012a;da Silva et al. 2013). Total flow discharged into the Great Barrier Reef lagoon for the period from 2000 to 2013. River flow is calculated from the sum of 35 river systems which flow directly into the GBR (http://watermonitoring.derm.qld.gov.au/host.htm). Flow is measured over a water year, calculated from 1 October to 30 September. The red line denotes the long-term annual median flow (calculated from 1970 to 2000). Sampling dates were representative of the river discharge peaks that occurred in the extended wet season (1 October to 31 May) from 2007 to 2013, considering all 35 rivers sampled over the GBR (Figure 5a) and also when Tully (Figure 5b) and Fitzroy (Figure 5c) are taken into account individually. The total maximum discharge peaks did not vary much among years, except for the 2007 and 2010 wet seasons, where flow peaks were at least 40% lower than in other years. Conversely, the length of the wet season varied among years, resulting in the differences in annual flow presented in Figure 4. Flow variability for an extended wet season (ca. from 1 October to 31 May) associated with the (a) GBR, (b) Tully River, and (c) Fitzroy River. The Tully flow variability is selected as representative of a wet tropics river, with the Fitzroy River representing the dry tropics. Sampling dates over the whole GBR, Tully and Fitzroy are identified in various colours per sampling year. An extended wet season was used to guarantee coverage of any changes in the rainfall regime and to avoid plotting long periods of the year without any runoff. Note the variation in flow volume on the Y axis. Concentrations of chl-a were variable across all regional transects (Table 2i), with mean chl-a concentrations ranging from 0.79 to 2.00 μg L-1, reflecting the highly variable productivity associated with sampling across the wet season and within nutrient-rich plumes. Mean chl-a concentrations presented for the four regions ranged from 0.33 to 4.18 μg L-1 (Table 2ii-v) across the sampling period for all years. A Kruskal-Wallis ANOVA test identified significant differences between chl-a concentrations across regions (chi-squared value = 20.545, df = 5, p < 0.001) and over the sampling years (chi-squared value = 31.841, df = 6, p < 0.001). (i) Data grouped over all years (2006–2013) within each transect. Sampling period is constrained for the months December to April inclusive. Transect is defined by location of closest river influence. Annual statistical measurements of chl-a concentrations are also presented for (ii) Tully, (iii) Herbert, (iv) Burdekin, and (v) Fitzroy. Chl-a concentrations measured at each region were compared across variable flow conditions and salinity ranges (Figure 6). With the exception of the Herbert River, a significant difference for all rivers was identified at p < 0.02 for comparisons of flow regime by a Kruskal-Wallis ANOVA test (Table 3). The highest median concentrations were associated with the highest flow regimes (> 95%) for the Tully (0.95 μg L-1) and Fitzroy (0.5 μg L-1) rivers. Variations in chl-a concentrations did not show dependence on inflow regimes in the Herbert region, where no significant difference across flow regimes was detected (p = 0.15, Table 3). 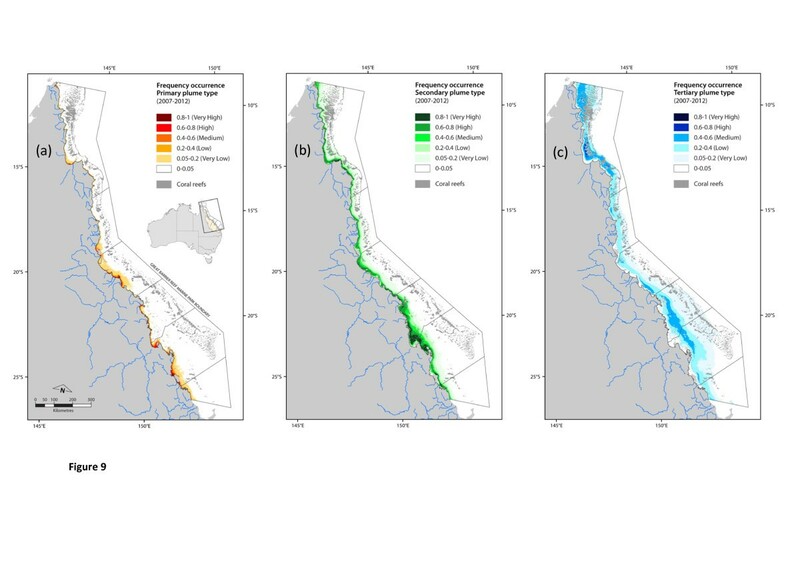 Samples taken in the Burdekin River did not cover all flow conditions, but large flows out of the Burdekin tend to flow above median conditions (> 75%) for several days during wet season sampling, making it difficult to sample along a flow continuum. Chl-a concentrations through salinity ranges were significant across the regions (Table 3), however peak median concentrations in Tully [1.4 μg L-1 (0.1–3.8), mean range)], Herbert [1.6 μg L-1 (0.1–5.9)] and Fitzroy [3.9 μg L-1 (0.1–10.5)] were recorded at mid salinity ranges (10–20, 20–30). The highest chl-a concentrations in Burdekin were measured in the low salinity grouping [1.0 μg L-1 (0.1–32)]. Chlorophyll-a concentrations across flow conditions and salinity ranges. Flow conditions are classified by percentile flow based on the long-term data from each river. Box plot presents the median (dark black line), the 25th and 75th percentiles (rectangle), and three standard deviations (vertical dashed lines). High frequency sampling in coastal waters under influence of the Tully River (Figure 7) allowed further elucidation of the seasonal patterns of chl-a concentration. Chl-a concentrations in Tully River plumes measured from 0.1 to 9.74 μg L-1 (1.91 ± 4.6 μg L-1, mean ± 1 SD) over the 7 years. Repeated sampling over a range of flow conditions during the wet seasons showed the range of chl-a concentrations was higher above the threshold value of 0.45 μg L-1 (GBRMPA 2010) 79% of the time (i.e., 357 occurrences of 452 sampling occasions). Comparison of the mean chl-a value per sampling year with the recommended water quality guidelines (GBRMPA 2010) shows the average wet season value consistently was above this threshold (Figure 8). 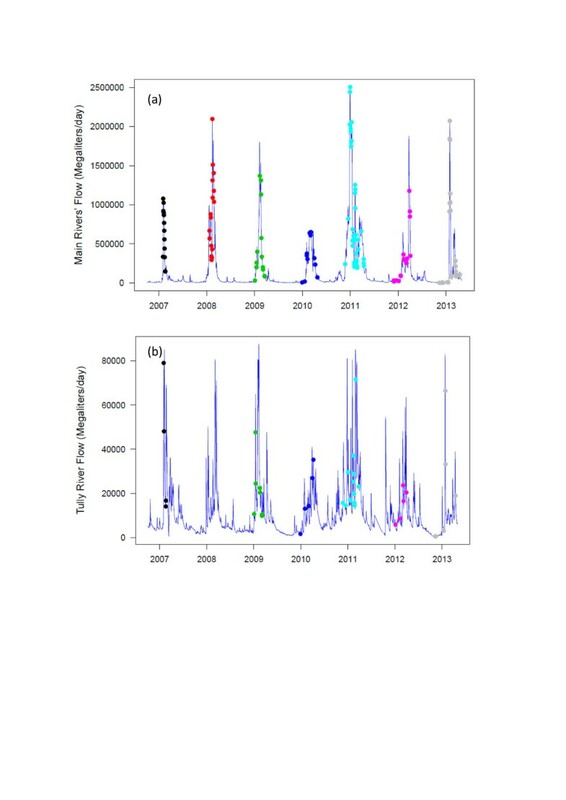 Flow variability for the Tully River over the sampling period with concurrent in-situ chl-a concentrations for 40 sampling occasions within the Tully marine area between the 2006/7 to 2012/3 wet seasons. Annual mean chl-a concentration measured per year (excluding the 2007/8 wet season) in the Tully marine region. Dotted red line represents the annual water quality guideline for inshore waters (GBRMPA 2010). The guideline represents an annual average but is used to demonstrate the distribution of high chl-a during wet season conditions. Multi-annual plume frequency maps for a 7 year period (2007–2012) are presented for each plume type over the extent of the GBR (Figure 9). The extent of the primary water type (fp) was variable across regions and cross-shelf, reflecting the intensity, duration, and constituent concentrations of the river discharge, but limited to a small near-shore zone (< 10 km across the shelf). On average, 5,000 km2 of the GBR lagoon was covered by primary plume waters no less than 50% of the time. Multi-annual maps of primary, secondary, and tertiary plume water types in the GBR (2006–2012). Note plumes were not contemporaneous but occurred from Dec 2010 to April 2011 inclusive. The multi-annual frequency of plumes is based on a 22 week period between December and April, combined over the 6 years and were mapped for (a) primary, (b) secondary and (c) tertiary plume waters. The extent of the secondary and tertiary flood plume frequency (i.e., fs and ft), rarely could be attributed to an individual river, particularly from wet tropics rivers which can merge into one heterogeneous plume. Most of the time the secondary plume waters covered 25,000 km2 of the GBR lagoon and tertiary plume waters covered 43,000 km2. In-situ water quality concentrations (chl-a, TSS, KdPAR) were assigned to a frequency class based on the dominant water types [ fp, fs, or ft > 0.5]. 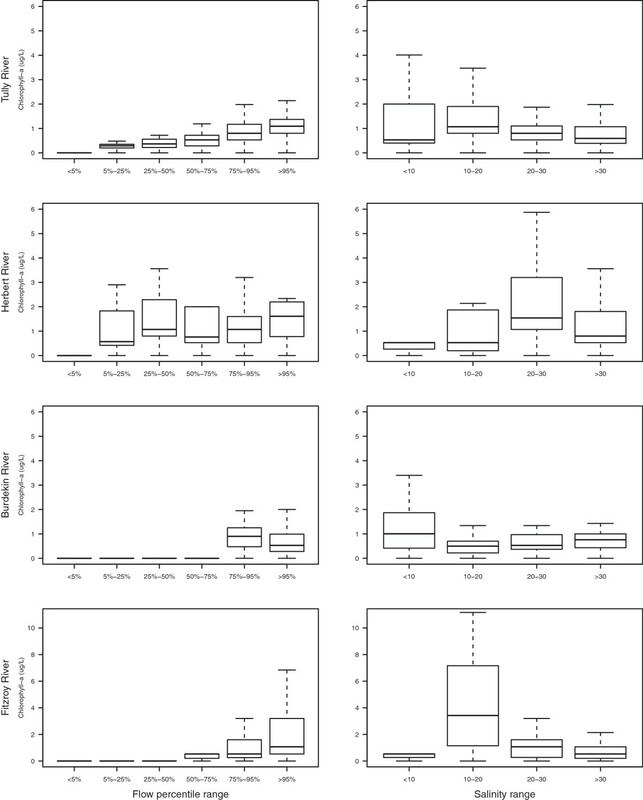 The variation of concentrations in the three water quality parameters among the three water types showed a strong water quality gradient over multi-annual time-scales (e.g., as described in Devlin and Schaffelke 2009 and Devlin et al. 2012a) (Figure 10). TSS concentrations were highest in the lower salinity zone close to river mouths, and concentrations decreased through the three flood plume water types [mean ± 1SD for TSS (fp, fs, ft) = 36.8 ± 5.5, 8.9 ± 3.2, 7.0 ± 4.4 mg L-1]. This pattern reflected the sedimentation of the heavier particles as the water moved away from the river mouth, with only the finer colloidal sediment moving further offshore (Bainbridge et al. 2012). In contrast, the chl-a concentration was lower in the primary waters, suggesting that phytoplankton growth was reduced through light limitation (mean KdPAR = 0.70 ± 0.54) in the initial turbid primary water type (Devlin and Schaffelke 2009) and increased through the secondary water type with increasing sedimentation and nutrient availability (Figure 10). The concentrations were lower in the tertiary zone, suggesting dilution processes and biological uptake as the flood plume aged over time and space [mean ± 1SD, chl-a (fp, fs, ft) = 0.98 ± 0.2, 1.3 ± 0.6, 0.7 ± 0.3 μg L-1]. Mean concentrations of in-situ water quality measurements within each plume type. Water quality data were assigned to plume water type based on dominant frequency (frequency > 0.5). Data are reported for (a) total suspended solids (TSS), with higher values in the primary plume zone, (b) KdPAR, with higher values in the primary plume zone, and (c) chl-a, with highest values in the secondary plume zone. Figure 11 represents the mean value for each water quality parameter (TSS, KdPAR, and chl-a concentration) plotted against increasing frequency values for the three water types. In these plots a frequency of 1 (f[1.0]) means a location was occupied by a particular water type 100% of the time, and f[0.5] means a location was occupied by that type half the time. Mean concentrations of TSS in primary waters rose with increasing occurrence of primary plumes (i.e., f p [0–0.2] < 5 mg L-1 to f p [0.8–1.0] > 25 mg L-1). The highest TSS concentrations related to an area where primary waters have occurred more than 80% of the time and were likely to have TSS values of greater than 25 mg L-1 during the wet season. TSS showed an inverse relationship in the secondary waters where mean TSS values of greater than 15 mg L-1 [f s [0.0–0.2]] fell to less than 10 mg L-1 [fs[0.7–1.0]] with reduced error around the mean at higher frequencies of occurrence of secondary plumes. Plots representing mean concentrations (± SE) of TSS, chl-a, and K d PAR, calculated for each annual frequency class for primary ( f p ), secondary ( f s ), and tertiary plume frequencies ( f t ). Annual frequency values were calculated from the frequency of each plume type occurring over a 22 week period normalised to a value range of 0–1 and averaged over the 6 year period. The red lines for TSS and chl-a are the annual water quality guidelines for the GBR (GBRMPA 2010). The dashed line is the mean water quality value over all frequency classes. Assessment of light attenuation (KdPAR) was partially compromised due to reduced number of in-situ measurements but followed the general trend exhibited by TSS (Pearson’s correlation = 0.677, n = 298). 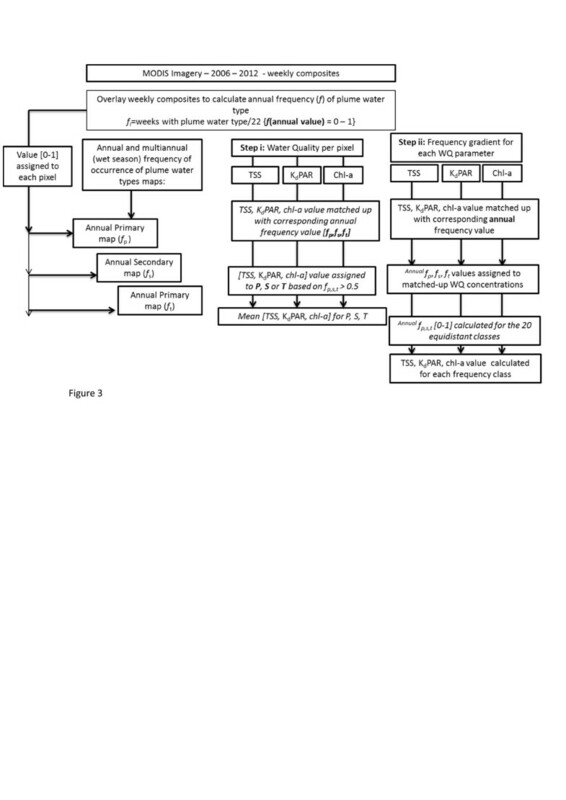 In general, KdPAR presented a variable pattern with values greater than 0.6 m-1 [fp[0.65]] to 1.9 m-1 [fp[0.9]] in the areas with high occurrence of primary waters. 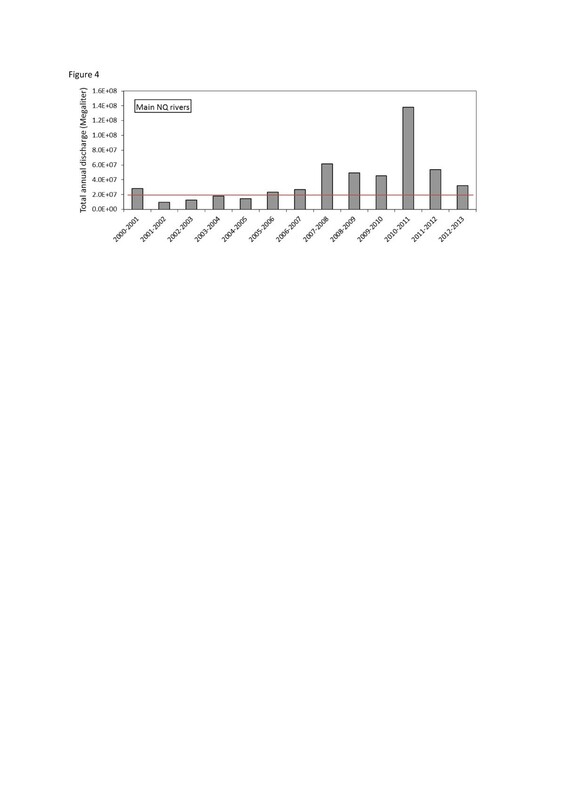 Mean values of KdPAR ranged from 0.2 m-1 [fs[0.1]] to 1.2 m-1 [f s [0.05]] across the frequency classes of secondary waters and remained low (KdPAR < 0.6) for the reduced number of classes measured in tertiary waters. The mean concentrations of chl-a varied from 0.6 μg L-1 [fp[0.95]] to 3.7 μg L-1 [fp[0.45]] across the frequency classes of primary waters and from 0.7 μg L-1 [f s [0.15]] to 2.7 μg L-1 [fs[0.5]] across the secondary classes. In the tertiary waters, values dropped from 1.6 μg L-1 [ft[0.15]] to less than the water quality threshold value of 0.45 μg L-1 [ft[0.55]]. The variation in the chl-a concentrations in the primary and secondary waters showed a maximum peak around f[0.5], which was not observed for the tertiary waters. These increased chl-a concentrations for primary and secondary plume waters suggest that locations 'sharing’ primary and secondary waters benefitted from the reduced light-limiting conditions characteristic of secondary waters and the availability of nutrients from the primary plume waters. Mapping the annual frequency of the secondary water type (Figure 12) gave a qualitative estimate of the area, where high concentrations of chl-a occurred during wet season conditions from 2006 to 2012. Secondary plumes, as mapped using this method, represent surface plume waters characterised by moderately elevated TSS with sufficient light and excess nutrients to support elevated phytoplankton growth (thus observable as green water masses). Areas of high chl-a biomass (identified as secondary plume waters) for each sampling year. Secondary plume water was identified from MODIS true-colour imagery (see Álvarez-Romero et al. 2013). Frequency of plumes was based on a 22 week period between December and April. Plume frequency was calculated as an averaged normalised value representing 22 weeks in each wet season. 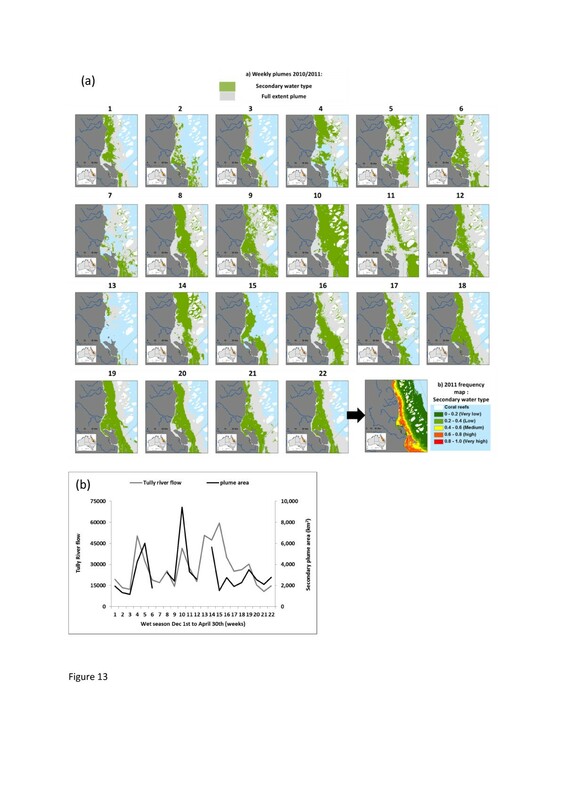 Identifying the full extent of these secondary waters on a weekly basis provided recurrent production maps and identified the area in which high phytoplankton biomass production occurred during the variable wet season conditions (Figure 13a). The extent of the secondary flood plume on a weekly basis varied from 1,163 to 9,433 km2. The area of the secondary flood plume was correlated with the Tully daily flow (Figure 13b). For example, the first flush of the wet season resulted in a secondary flood plume extent of 6,012 km2, with a lag of 1 week between high flow and full extent. The extent of the secondary plume in the Tully-Murray marine region over 2010/2011 wet season, including. (a) The area of secondary plume map aggregated over each week. (b) Area of plume (km2) is presented for each week from week 1 (1–7 Dec 2010) to week 22 (23–30 April 2011). Daily flow data (ML/day) are shown for the same period for the Tully River (data from Department of Environment and Resource Management). Simple indices of phytoplankton biomass, as measured by chl-a, provide an accurate means of quantifying broad-scale water quality within the Great Barrier Reef region. 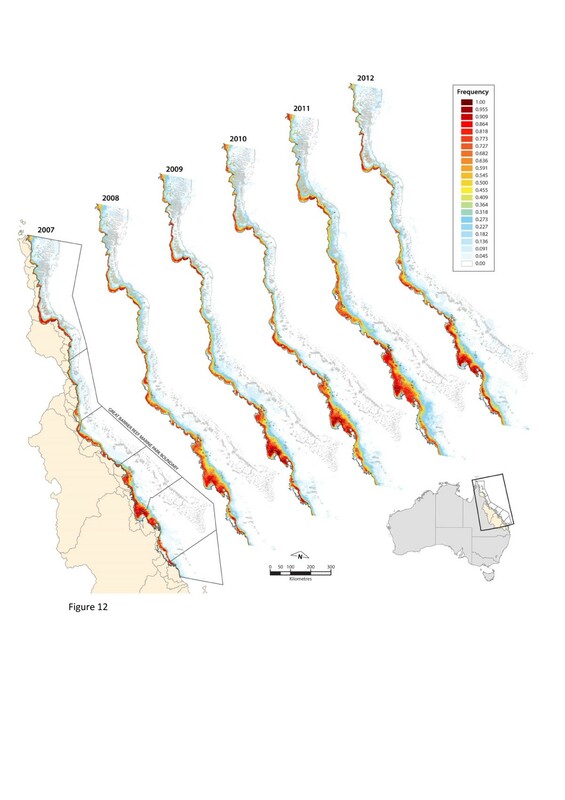 These data can be used as a baseline for ongoing investigation of impacts of increased nutrient discharges into Great Barrier Reef waters, such as assessing the role of altered water column nutrient status on COTS outbreaks and the influence of agriculture and urban coastal settlement on regional water quality. The onset of the wet season and high flow conditions provides nutrient-rich waters that can nourish and enhance phytoplankton growth. The magnitude and timing of flow are important co-factors in the distribution of flood waters and the range of water quality concentrations measured over the sampling period. Inner-shelf reefs of the wet tropics region—an area of high rainfall (1,200–4,000 mm average annual)—are exposed regularly (one to several times per year) to land-based pollutants via flood plumes (Devlin et al. 2001;Devlin and Schaffelke 2009;Lewis et al. 2012), while inner-shelf reefs of the regions to the south of the wet tropics (i.e., Burdekin, Mackay, Fitzroy, and Burnett regions) are exposed less frequently but to larger flood plumes that often travel great distances (Devlin et al. 20112012a, b). Flow conditions have always been variable, however there is a strong consensus that we are now seeing the impacts from more extreme weather conditions through these higher flow conditions (Elmhirst et al. 2009;Johnson et al. 2013). 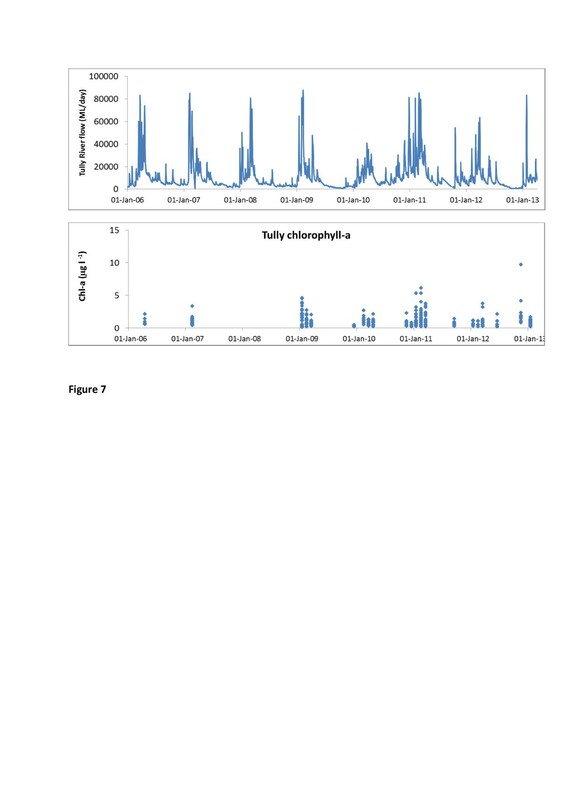 Comparative analysis of phytoplankton biomass measured in plume conditions with co-factors such as flow and salinity (Figure 6) is key information for understanding the response of phytoplankton standing stock to the input of nutrient-enhanced flood waters. Mean concentrations of chl-a measured in the flood plumes (Figure 8) (0.77–2.55 μg L-1) are higher than the annual water quality guideline (0.45 μg L-1,GBRMPA 2010). The highest concentrations were recorded during high peak flows (Q95; Figure 6) for the Tully, Burdekin, and Fitzroy rivers. The Herbert River also showed high concentrations at lower flow quartiles (Q05, Q10), potentially reflecting the complex hydrodynamics around Hinchinbrook Island and the southern influence of the Burdekin River. First flush events, even at low flow conditions, are responsible for the increased delivery of dissolved inorganic nitrogen into the coastal zone (Devlin and Schaffelke 2009) from rivers with catchments containing large areas of fertilised cropland (Mitchell et al. 2009). These higher values at lower flow quartiles also suggest that the productivity in the coastal system is enhanced outside of the high flow periods. High chl-a in low river discharge conditions can be driven by sediment resuspension events in shallow waters (depth less than 10 m) where dissolved inorganic nitrogen and dissolved inorganic phosphorus mineralised from particulate nitrogen and phosphorus in benthic sediment are injected back into the water column (Chongprasith 1992;Walker 1981;Muslim and Jones 2003;Ullman and Sandstrom 1987). Resuspension of benthic sediment during cyclonic conditions occurs down to depths of 30 m and also causes phytoplankton blooms on the GBR shelf (Furnas 1989). Over the wet season, however, the dominant driver of high chl-a concentration is the delivery of nutrient-enriched river waters. A comparison of daily flow data from the Tully River with daily in-situ chl-a data for the period 2006–2013 showed peaks in river flow are highly correlated temporally with elevated chl-a concentrations (Figure 7). Using data collected with high frequency for one key catchment shows that chl-a concentration is high in comparison to the GBRMPA annual guideline (GBRMPA 2010) and elevated above other reported concentrations (Brodie et al. 2007;Schaffelke et al. 2012; Figure 8). The recommended GBRMPA water quality guideline for chl-a is an annual mean measurement and, as such, is not directly comparable against chl-a data collected through the wet season only. However it does provide a reference at which to compare the chl-a data collected in the high flow periods over multiple wet seasons and illustrates the higher values measured within the wet season in the Tully marine region. Brodie et al. 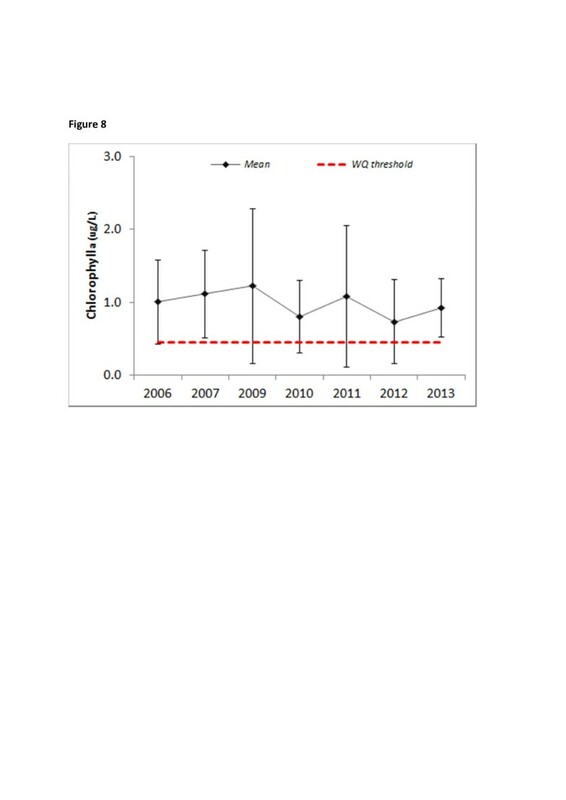 (2007) reported on a long-term Great Barrier Reef chl-a monitoring program which demonstrated a significant cross-shelf difference in chl-a concentrations. Data from this program also highlighted a strong regional pattern, where the inshore wet tropics had high wet season concentrations in comparison to the northern and southern transects. Brodie et al. (2007) suggested this variation in baseline and seasonal chl-a concentration was related to the differences in catchment loads where fertilised agriculture in the wet tropics contributed to high concentrations of dissolved inorganic nitrogen in riverine flow (Kroon et al. 2012;Brodie and Waterhouse 2012;Wooldridge et al. 2006). In the Tully River nitrogen concentrations rose significantly in the period 1987–2000 (Mitchell et al. 2001). Particulate nitrogen concentrations doubled and nitrate concentrations increased by 16% over this period (Mitchell et al. 20012009). The cropping activities, primarily sugar cane cultivation, are concomitant with high fertiliser application rates and higher nutrient delivery in the rivers (Brodie and Mitchell 2005Brodie et al. 2013;Kroon et al. 2012;Waterhouse et al. 2012). The frequency of water types across the flood plume is comparable with our current understanding of water quality gradients and supports the validity of the classification method applied in this study. The higher frequency associated with the primary flood plume water type (fp) reflects the intensity, duration, and constituent concentrations of the river discharge but is limited to a small near-shore zone (< 10 km across the shelf). These characteristics are strongly linked to the catchment hydrology and land use practices. For example, the two larger catchments over the GBR, which are under extensive agricultural development (i.e., Burdekin and Fitzroy rivers, which have greater than 80% of area utilised for agriculture), are associated with a larger area of turbid primary waters. Secondary and tertiary plume frequency (i.e., fs and ft) cannot always be attributed to an individual river, particularly in the case of wet tropics rivers, which can merge into one heterogeneous plume. The area of secondary flood plume types is influenced by the onset of the primary plume through the river discharge and the local hydrodynamic conditions, mainly controlled by tides (e.g., Valente and da Silva 2009), wind regime (Dzwonkowski and Yan 2005;Lihan et al. 2008), bathymetry (e.g., Lee and Valle-Levinson 2013), and Coriolis force (Geyer et al. 2004). Mapping the annual frequency of the secondary water type (Figure 12) gave a qualitative estimate of the area where high concentrations of chl-a have occurred during wet season conditions between 2006 and 2012. The chl-a concentration distribution is variable through the three water types, and in both primary and secondary flood plume plots, there is a peak of concentration where fp and fs equal 0.5, suggesting that there is a transition zone between these two water types that presents optimal environmental conditions leading to high chl-a concentrations. Figure 11 suggests that these chl-a peaks are driven by a reduction in both TSS and KdPAR values. Waters dominated by primary (e.g., fp > 0.8) or secondary (e.g., fs > 0.8) plumes usually exhibit lower chl-a concentrations compared to waters where plume type is more variable (e.g., fp or fs < 0.6). These transitional conditions potentially represent an ocean front where the denser water under-rides lighter water, giving rise to an inclined interface and a strong convergence at the surface, which can concentrate phytoplankton and pollutants (Klemas 2012). In complex coastal areas, field data and ecological evidence are very difficult to acquire because of the temporal variability in spatial patterns of all ecological conditions and biophysical drivers causing change. Flood plume water types over multi-annual (Figure 9), annual (Figure 12), and weekly (Figure 13) time scales provide synoptic information in monitoring the water quality conditions of GBR coastal waters. Some limitations are inherent in the true-colour classification approach used to categorise plume type in this study. One limitation described in Álvarez-Romero et al. (2013) is the presence of other surface water masses that can be confounded with plume waters. For example, Broad Sound Channel and Shoalwater Bay, north of the Fitzroy River mouth, are areas where high turbidity occurs in the absence of plumes, mostly associated with strong tidal currents (Kleypas 1996), resulting in low confidence for accurate classification. Another limitation is the use of ocean colour data alone. Stretching of the red-green-blue images produced in SeaDAS is image-dependent and, thus, true-colour classes might be inconsistent over time. Furthermore, no atmospheric correction is applied to the true-colour images and might lead to misclassification. The impact of such misclassifications on the estimation of the primary, secondary, and tertiary water type maps should be further investigated. Despite these acknowledged limitations, the utility of the classification method is corroborated by the measurements of in-situ water quality parameters among the three water types observed over multiple years (Figure 9). The field observations reveal meaningful quantitative differences when organised along the gradients of flood plumes classified with the true-colour approach. Connections between environmental variations and ecological systems occur across a large range of interacting spatial, temporal, and organisational scales. Collecting information at temporal or spatial scales that capture the environmental frequency and variability of patterns is essential for the decision-making process (Ostendorf 2011). Remote-sensing technologies can provide the synoptic window necessary for inventory and mapping of ocean ecosystems with information at different spatial and temporal resolutions. Using remotely sensed information in conjunction with in-situ data provides complementary approaches which allow extrapolation of the site data to a larger area and, conversely, provides validation of the remote-sensing data. Mechanisms by which phytoplankton biomass is controlled within GBR waters are through a number of co-determinants including existing nutrient pools, export and import of GBR nutrients, disturbance, grazers, and physical conditions. The higher nutrient concentrations and shallower water present in the inshore areas would typically result in high episodic pulses of phytoplankton growth. However, the difference in the productivity of the inshore GBR driven by natural processes and productivity which has increased through nutrient enrichment, resulting in the accelerated growth of phytoplankton beyond a natural threshold, can be difficult to resolve. The current marine monitoring water quality program provides valuable information on a regional basis which can be and has been used to map acute pressure from polluted river waters (Devlin et al. 20102012a). The value of intensive sampling around the formation and development of flood plumes in the coastal area is essential in our understanding of the short-term influence of river flow enhanced by sediments, nutrients, and pesticides. 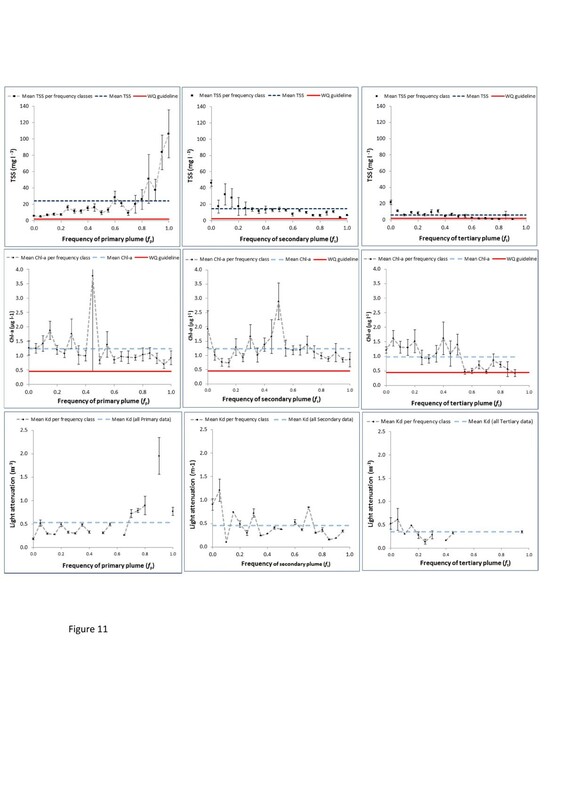 The more intensive sampling associated with wet season monitoring under the current Marine Monitoring Program has now measured water quality under various flow conditions over periods of days to weeks after peak flow. Use of either in-situ data or data derived from remote sensing provides information on small to large scales, but in isolation, each data source is of limited use. Combining the data across the various scales and sensor types can enhance the information from each individual source. This paper presents only one data parameter and one type of mapping output as an example of the process of integrating variable data sources. Combining information from in-situ data with remotely sensed data can allow greater extrapolation of the point data into a spatial framework (Table 4). Concentrations are driven by the intensity of the flow, with highest concentrations measured at high flow peaks. However, when coupled with the spatial data, the highest chl-a is also linked to the transitional area affected by both primary and secondary plume waters that result in increased light, which can foster phytoplankton blooms. Note that these high biomass conditions are dependent on nutrient availability and may eventually be constrained through nutrient uptake. The process of high nutrients and clearer waters resulting in high measures of chl-a in the later stages of plume development has been explored in other work (Devlin and Brodie 2005;Devlin and Schaffelke 2009). Chl-a = chlorophyll-a, Qa = quantitative, Ql = qualitative, TC = true colour. Knowledge of the areas and types of ecosystems that are the most likely to be impacted by changing water quality can help focus our understanding on what types of ecological impacts are occurring to those systems to help inform marine, coastal, and catchment management (Brodie et al. 2012). Details of the movement of pollutants and frequency of inundation can be key measurements in attributing water quality decline to ecosystem change. Detection and monitoring of nutrient enrichment and associated impacts in the Great Barrier Reef require a focus on the analysis of long-term in-situ data (Furnas et al. 2011;Schaffelke et al. 2012) and the inclusion of data collected over high flow events. Resolving the spatial extent of nutrient-enriched waters through the measures of high chl-a requires the analysis of remotely sensed data to fully capture the wet season variability. 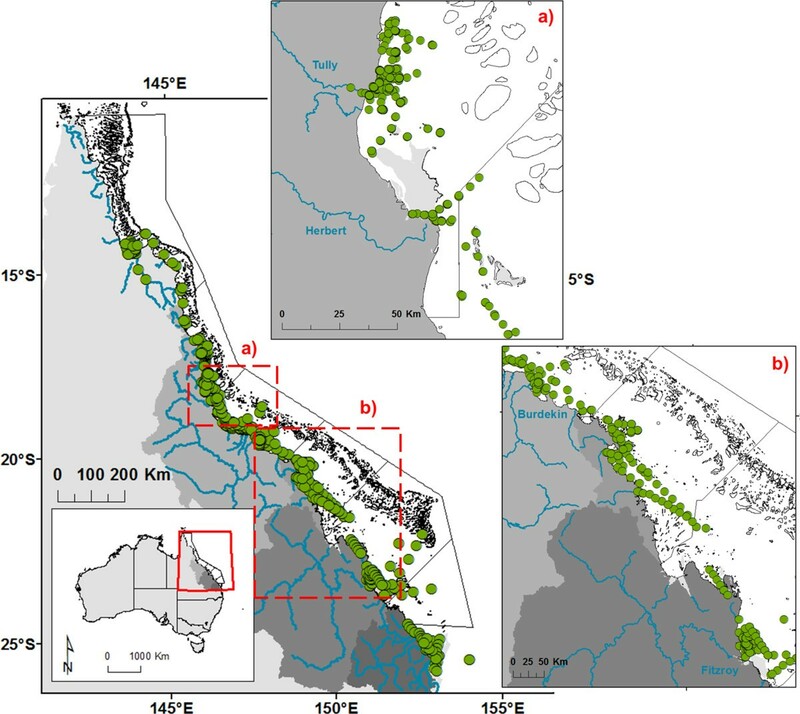 Combining these data sources enhances the ability to describe and distinguish anthropogenic impacts from natural wet season processes in the GBR coastal system. Waters influenced not just by phytoplankton and related particles, but also by other substances, that vary independently of phytoplankton, notably inorganic particles in suspension and yellow substances. The authors would like to thank the Department of Sustainability, Environment, Water, Population and Communities and the Great Barrier Reef Marine Park Authority for their financial support for the ongoing work in the Reef Rescue Marine Monitoring Program. We would also like to acknowledge the contribution of valuable discussions and interactions with staff within the collaborating organisations in the MMP. In addition, the field assistance and coordination from Jason and Rebecca Rowlands at Mission Beach Charters is greatly appreciated. Thank you to the reviewers and editors for comments which have greatly improved the contents of this paper. MD was the lead author, drafted and completed the manuscript and carried out some of the water quality analyses and integrated remote sensed outputs with water quality data. ED, CP, JR, AW all participated in manuscript development, writing and editing. ED, CP and JR carried out the analysis around the more complex modeling of water quality data and the mapping of remote sensing information over weekly, annual and multiannual scales. DT and DZ provided expertise in spatial analysis and mapping outputs. JB provided comments on the final manuscript. All authors read and approved the final manuscript.